This is something I have wanted to do for a while! My lovely puffin mug (the one on the right) that was accidentally smashed by my eldest when she was little (the restored graphic was one of my first postings!) and then stuck together with sellotape and modeling resin has been useless for anything other than storing bits and pieces – until now! 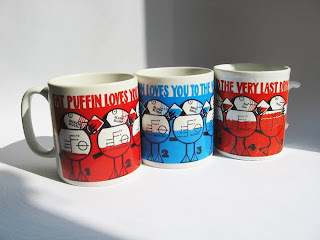 My youngest is quite taken with the whole ‘Puffin Thing’ and loves Fat Puffin, asked if she could make a different coloured image – easy on most image manipulation software – and then asked for a mug for her birthday. I finally sent both image files to the nice people at tshirtstudio.com who did a sterling job, turning it around in 48 hours!! So I had the pleasure of drinking my tea from a treasured classic – as did my youngest! Please don’t ask me to make these up for any of you! The copyright issues are hideous!! I found your blog while looking up Puffin Club items on the net. I’m ebaying a lot of my childhood possessions after my mum’s house-move last year and I was wondering how much my old Puffin Club bits and pieces were worth. I was delighted to find your site I’ve realised now that I really don’t want to get rid of any of my Puffin stuff! I have 13 issues of PPost (vols 12-14, and two plastic folders for them), a 1979 diary, lots of paper bits and pieces (including a letter signed by Sylvia Mogg), and an unbroken Fat Puffin mug! You’re welcome to scans of any of the above if you would like. I actually have an unbroken run of all of the original A5 puffin posts – with the exception of Vol.17 No4! It is extremely annoying as the later copies rarely (if ever) come to light. Of the later A4 editions, I have a handful of copies, but I see these as the last attempts to find a direction for a dwindling membership. The eighties were a tough time for the thoughtful child! I recently got hold of a copy of ‘Puffin Flight’ – actually sold with its price on the cover! I assume the Diary is the one with the green and gold print of Fat Puffin opening a present – I still have mine, though it is a bit worn. If yours is in good condition, I would love to get a scan of the front and back cover – it would save a lot of hard work in restoring my one. BITS OF PAPER! These are gold dust – they always got thrown away, but often they are a source of wonderful artwork and record of events and competitions. If your mug is one of the other designs, I would love to see photos. I have tried to access your Yahoo page without success – email me using the link on the ‘about this site’ section.